You would be forgiven for losing count of the number of Intel Core i9-9900 variants that have already been spotted of pushed out of the door. On Xmas Eve we spotted the Intel Core i9-9900KF listed in Scandinavia (before it was officially launched at the CES 2019). At the end of January a purported engineering sample Intel Core i9-9900T was spotted (35W, low power optimised). More recently we spotted benchmarks for an Intel Core i9-9990XE, a limited edition processor with 255W TDP and AiO cooler requirement. Even more recently, we spotted a pair close relatives of the i9-9900 on the way for laptops, the i9-9980HK and i9-9980H. Here is another Core i9-9900 variant that is yet to be officially announced. 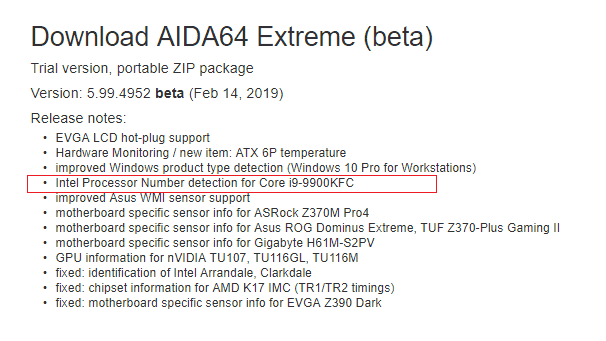 What appears to be an upcoming CPU by the name of the Core i9-9900KFC features in the latest AIDA64 Extreme (beta) changelog. As Anandtech reports, various software, firmware and hardware designers get to know about various Intel and other processor releases earlier than Joe Public as they need to complete works to be ready for when these processors become available. Thus we often see unannounced new hardware inadvertently leaked in release notes and code samples. So what is a KFC processor? We don't get any info from the AIDA64 changelog other than the name but luckily Intel's processor suffixes form a consistent nomenclature. I've bullet-pointed the guesstimated qualities of the processor indicated by the trio suffixes, but only the last one is really not cut and dried. The source indicates that the 'C' suffix eDRAM boost would provide performance increases only on a couple of metrics. 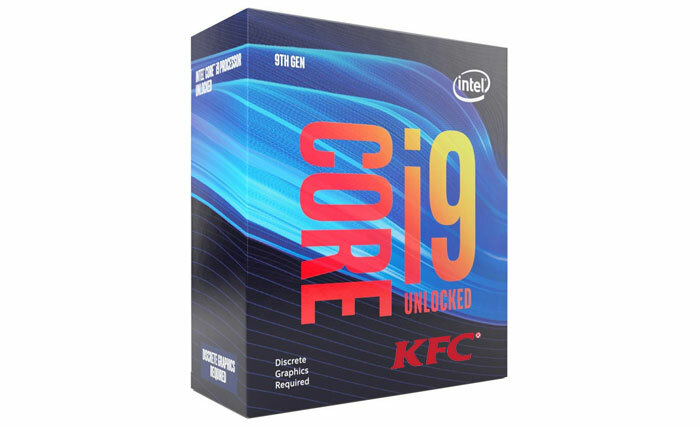 Thus it will be interesting to see Intel's explanation of the Core i9-9900KFC if it does indeed become a shipping product. It comes unlocked, see how far you can push it before you chicken out..
That artist impression using the actual KFC logo is hilarious haha.